Do you want to brush up on your grammar and speaking skills? 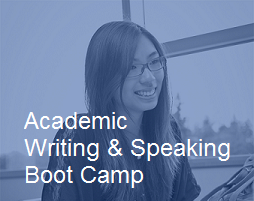 If so, register for Academic Writing and Speaking Boot Camp, a four-day intensive workshop during Reading Break. The workshop will focus on grammar and style in the mornings and tutorial participation in the afternoon. Offered in collaboration with the Center for English Language Learning, Teaching, and Research (CELLTR).